TCP/IP must be enabled for users who are running SQL server on their workstations. Note: Users with SQL Server 2012 installed, SQL Server Network Configuration can now be accessed via Control Panel > Administrative Tools > Computer Management. Click on Microsoft SQL Server 20XX. 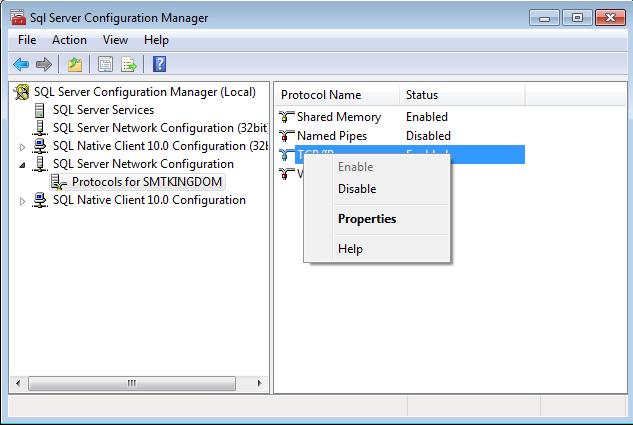 Expand the Configuration Tools subfolder and right-click on SQL Server Configuration Manager. Click on Run as Administrator. Select SQL Server Network Configuration and click Protocols for SMTKINGDOM. In the right pane, right-click TCP/IP and click Enable. In order for the changes to take effect, you need to restart the server. Scroll down and right-click on the SQL Server (SMTKINGDOM)** instance and select Restart. Note: Make sure all programs using the SQL instance are closed before you restart. If you are still having trouble connecting to Kingdom, see Troubleshooting: Windows services SQL Server (SMTKINGDOM) and SQL Server Browser Are Running.